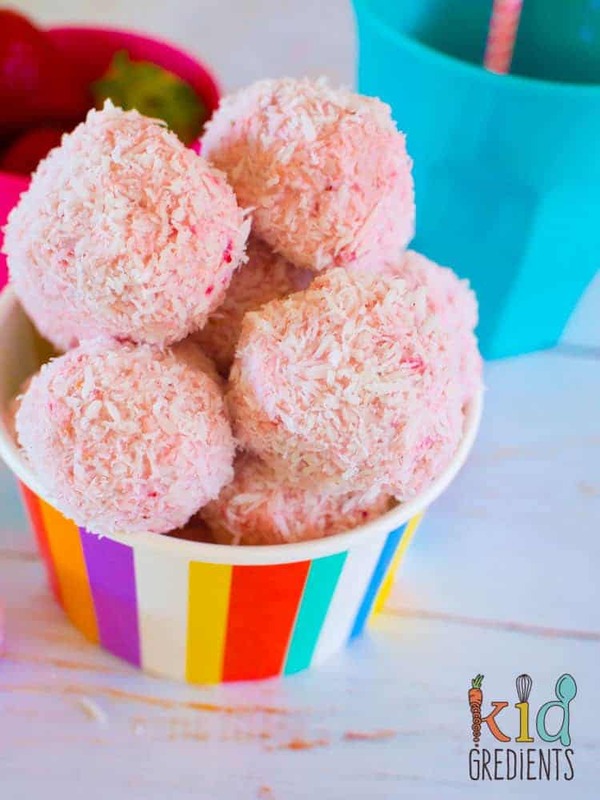 Um before we start on our 4 ingredient strawberry cheesecake bliss balls….let us dispell some myths around bliss balls. You do not need a thermomix to make them, every food processor should be able to handle it. If you’ve got a really good blender it will do the trick. Next myth. Just because it’s called a bliss ball, doesn’t mean it’s healthy. People make them out of tim tams and milo for goodness sakes. Finally, not all bliss balls taste like dates and cacao. 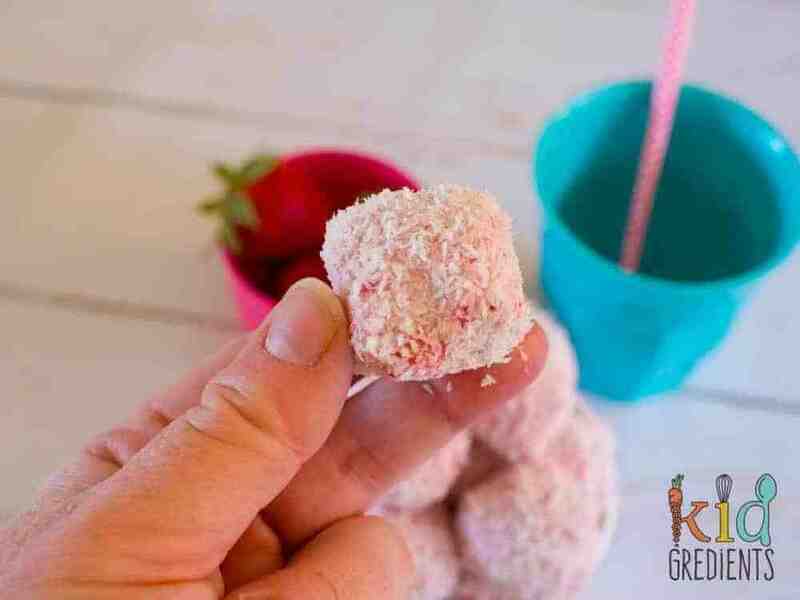 These ones, well they are 4 ingredient strawberry cheesecake bliss balls and pretty special! Strawberries are at the end of their season right now in Oz, which means, they are good still, but they need to be eaten quickly, no long term refrigeration! 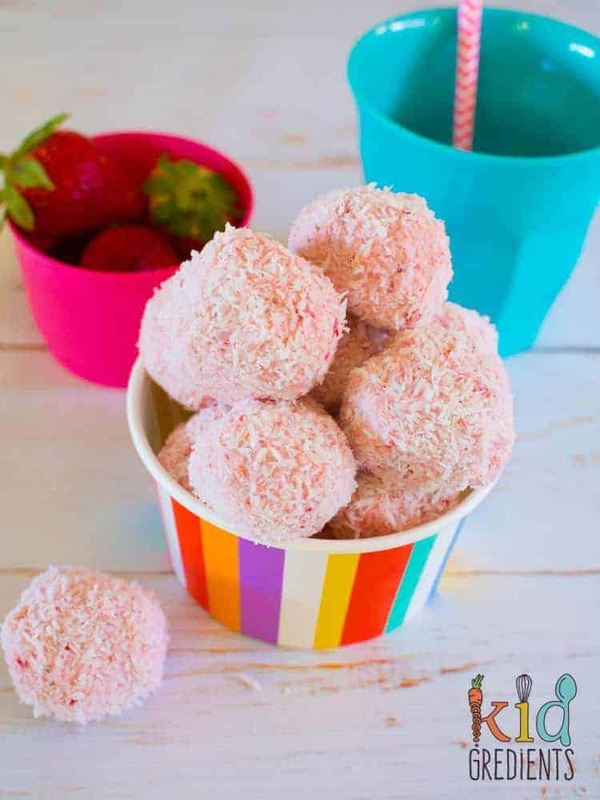 If you’ve got a family that aren’t devouring them at the rate of knots and you bought them on special at the fruit shop…then this could become your go to recipe, because strawberry cheesecake bliss balls are sooooo yummy. did I mention they are freezer friendly? These only contain 4 ingredients and are only sweetened by fruit, you don’t need anything else to make them taste amazing, especially when fresh fruit is in season. These keep really well in the fridge, but if you’re like me and like to switch around what’s on offer for lunch you will probably want to freeze these. So you’ll be happy to know that they freeze really well. go on…they are super sweet! It’s hard not to eat these all in one go…and they would also make an absolutely perfect afternoon pick me up. There’s a lot to be said for food that is so fuss-free your kids can make them, and so quick to make they can be whipped up in the morning before school. You do need a food processor or an amazing blender to get them to the right texture, but aside from that, no other fancy tools are needed except a knife and pair of hands! 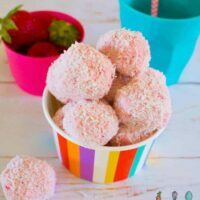 4 ingredient strawberry cheesecake bliss balls! Yummy, easy to make recipe that is kid friendly and freezer friendly! optional: mykids loved these without sweetener, but if yours don't- add a teaspoon of honey to the mix before rolling- I'd get them to try it first without though! 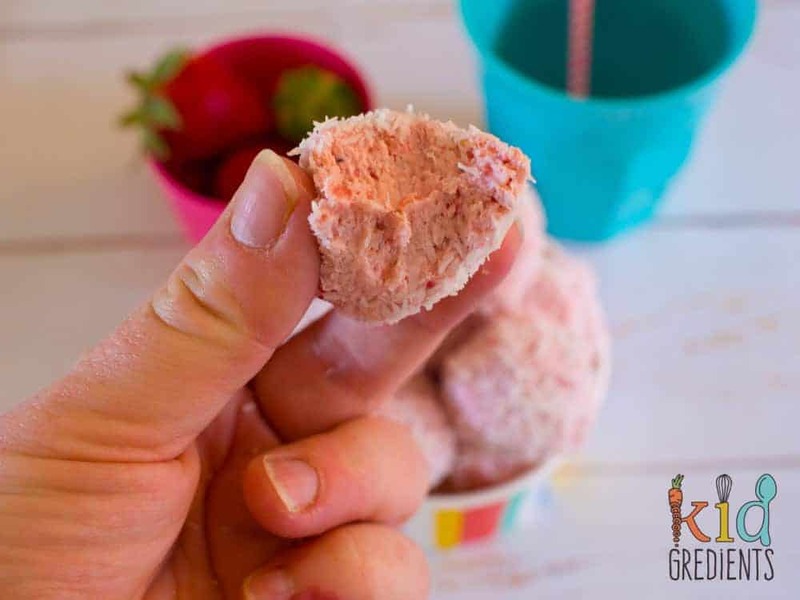 Combine the cream cheese, strawberries, lemon zest and coconut in a food processor. Blitz until the strawberries are chopped and through the cream cheese. It should be thick, not runny, imagine playdough consistency. Don't over process. These keep well for 3 days in the fridge but can also be frozen for up to a month. Defrost in the fridge overnight before putting in the lunchbox. **Optional: depending on your strawberries, they might not end up sweet enough. If that's the case, add a tablespoon of honey to the mix. My kids loved these without the honey, but we had super sweet strawberries. Previous Post: « Blueberry banana bread, dairy free and refined sugar free! That one is from Smash from a few years ago but I think they have similar at Little Bento World! Just made these. Id suggest 2 punnets of strawberries. Mine arent even pink! What did i do wrong? AHow ripe were your berries? And if they are the ones that are mostly white with a bit of red…they won’t turn pink! I put the coconut in too late! I think they are to rough now can this be fixed? Could you change the type of fruit? You could, but it might take some experimenting. How long can they be left out of the fridge for? we only leave them out to eat them! I’m making them for a party that’s all..
My daughter doesn’t care for coconut. What could i use in place of it? Graham Cracker Crumbs? It could work, but will increase the sugar content. Let me know how you go! Hi! Instead of lemon zest , can i use lemon juice? You can, but that will make them more moist so you will need to compensate for that with extra dry ingredients. I can’t wait to try these – my kids already like date, pecan and coconut balls so this will make a nice change! Is there anything else you could use if you don’t have a food processor? A stick blender could do the trick, or even a normal blender. I’ve just made these and the mix is delicious! It’s too soft to mould into balls so I’ve popped it in the fridge to set a bit. Any ideas how I can make them firmer or what might have happened? Hi Kat, you might have over blitzed. They will freeze, so maybe freezer for a little bit, then mould together? Ok, I’ll try that! Otherwise I’ll just eat the mix with crumbled biscuits or something haha! This happened to me too, should I add cookie crumbs or what do I do? Oh yum! Have you ever tried making these with frozen fruit? Or would it make it too wet? No, I haven’t as we’ve had fresh fruit on hand when I’ve made them. I think they might end up runny!